This hybrid wax applies like a soft wax, but removes like a hard wax. Stays flexible, never gets brittle. Thin application for full body waxing. Infused with nourishing coconut oil and honey extracts. Quick setting & easy removal. Be sure to apply a thin layer of wax. Unlike hard waxes, Flex Wax will not get brittle or chip. Large areas of the body can be waxed with ease. 1. Place collar on GiGi® warmer. 2. Remove plastic lid and place can in warmer. Set temperature to High for 30-45 minutes until wax has a thin/honey-like consistency, then set the temperature to Low for the rest of the day. 5. Holding the applicator at a 45° angle, apply a thin layer of wax in the direction of hair growth (if using near the eye area, instruct client to keep eyes closed). 6. Allow wax to cool on the skin until it becomes soft and pliable, approximately 30 seconds. 7. Hold the skin taut and pull wax off (parallel to the skin) with one quick motion in the opposite direction of hair growth. 8. Immediately apply firm pressure to epilated area with the cushion of your fingers or palm of your hand to calm the skin. 9. Apply GiGi Wax Off to remove any wax residue and to soothe & condition the skin. 10. 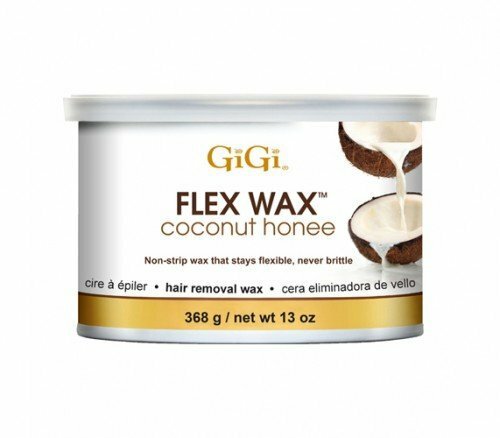 To maintain waxing results longer, advise client to smooth on GiGi Slow Grow, a hair minimizer, every day after showering.